When you think of art, you might think of a painted canvas, or sculpture, or drawings and prints, or photography. Bead embroidery, weaving and sewing might not immediately come to mind. North Charleston artist Camela Guevara is trying to change that. Her new exhibit at Redux Contemporary Art Center, “Care Work,” seeks to showcase the underappreciated art form that originated in the home and has traditionally been practiced by women. 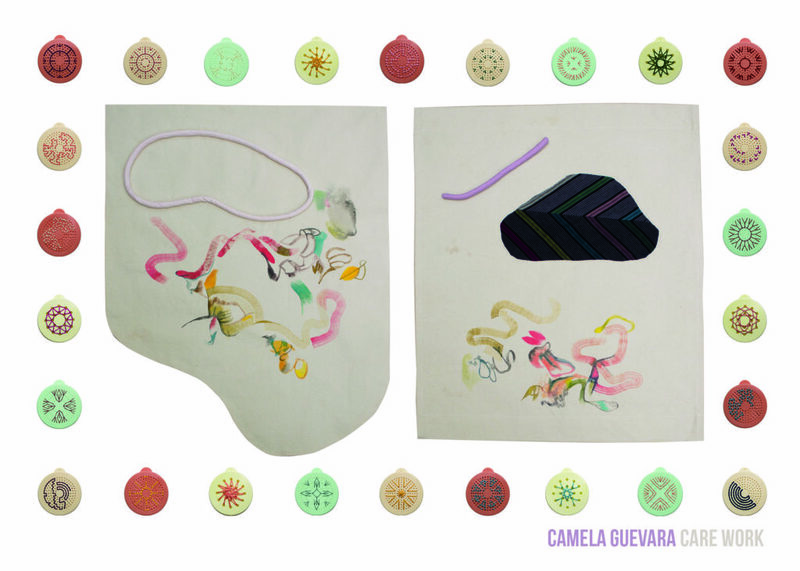 Guevara, who graduated from the College of Charleston and soon after rented a studio at Redux, extended her scope of the fiber art form by studying at the Penland School of Crafts, learning how to make fabric and tapestries. Already she had allowed sewing techniques and bead embroidery to seep into her artwork. This was a next step. To help counteract this system, Guevara, who is media manager at the College of Charleston’s Office of Sustainability, makes her own clothing in addition to embroidery artwork. “I am committed to making a wardrobe of handmade clothing or thrifted clothing to reduce my dependence on fast fashion and systems that create low-wage garment work at the expense of those workers,” she says. And for her new “Care Work” exhibit, she showcases those seamstress skills by embellishing shaker lids from H&L Asian Market in North Charleston, sun shades and other “found objects” that she uses as canvases with handmade cording. Along with her hand-sewn creations, painting also is part of the exhibit, as seen in Guevara’s colorful, whimsical banners.